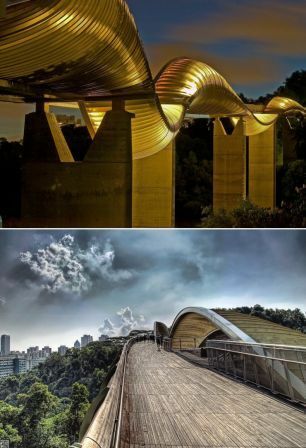 'Henderson Waves' is Wingapore's highest pedestrian bridge and can be found at the southern ridges, a beautiful 9km stretch of gardens and parks which has frequently drawn comparisons to New York's Central Park. The bridge itself is absolutely stunning. The deck is made from thousands of Balau wood slats, perfectly cut and arranged, and along the length of the deck a huge snaking, undulating shell cleverly forms sheltered seating areas on every upward curve.